The following is a Husqvarna Automower 450X product review written by Martin – a very tech savvy homeowner who purchased the robot mower from Gardenland Power Equipment and self-installed the mower. The product has been delivered as promised, well packed and on time. Installation was straight-forward following manufacturer instructions. The lawnmower works as advertised. It is too early (have been using it only for 2 days) to judge quality of mowing. The lawnmower is surprisingly quiet. It makes mowing at night non-disturbing even in our extremely quiet neighborhood. The iPhone app is usable although it could be improved. 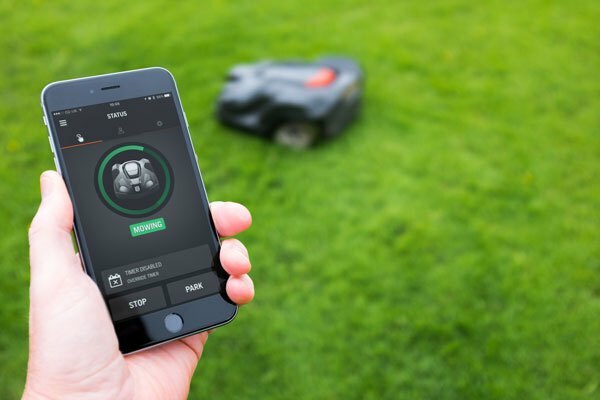 For example, the display of location and track of the lawnmower should allow panning and zooming using standard gestures. The owner manual shipped with the equipment does not cover all functionality. It refers to downloadable manual at manufacturer’s website. The more complete manual is somewhat hard to identify, because listing of documents for the product includes also electronic versions of the manuals shipped in the box. The titles of the documents do not allow easy identify which document is the right one. Neither of the manuals warns that GPS reception may be limited if the docking station is placed under cover (in my case under a deck), which in turn makes the location of docked lawnmower imprecise. This made the iPhone app show that the lawnmower is in neighbors driveway, while it was safely docked and charging. The iPhone app does not clearly indicate when the device is docked (which it definitely should). Another possible improvement: the iPhone app should show the perimeter of the geofence and ideally allow it to be modified and repositioned. This would make the process of setting geofence significantly easier. Bringing the device to the “very center of the installation,” as the manual instructs, is easier said (written) than done, especially if the area is irregular. Also in my case, the center is in the house which has metal roof severely limiting GPS reception. Despite the potential for improvement, especially in the iPhone app, I’m so far very happy with the lawnmower.